A female student at the University of Waterloo was struck and killed by lightning last Friday morning while walking on campus. The incident, which happened at approximately 9 a.m., occurred on a path leading to the Village 1 student residence. The Waterloo Regional Police Service has revealed that the female was a first-year nanotechnology engineering student from Markham and had not yet started classes, which were set to begin on Sept.8. “It was Orientation Week, so we don’t know where she was coming from or going to, although it does appear she was heading back towards the residences,” said Nick Manning, director of media relations at the University of Waterloo. Students apparently found the woman unconscious on the Village 1 pathway. They, with consultation of a residence don, called 911 to report the incident. The woman was taken to the hospital and died shortly before 10 a.m. The family, who were notified on Friday, has asked UW and WRPS to not release the name of the student. “Members of the university have also completely cooperated fully with the legal authority for this investigation. We’ve also made sure on Friday that we took steps to remind students the dangers of being out in inclement weather,” said Manning. The chance of being killed by lightning is very low in Canada, with the national average floating near nine or 10 per year. Many students met this incident, rare in occurrence, with disbelief. 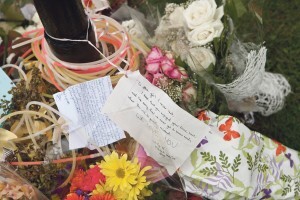 “At first I thought it was a hoax,” said Wilfrid Low, a first-year student at UW. The incident also made many aware of the dangers surrounding severe thunderstorms, causing students all around the region to stay off the streets and seek shelter indoors. “For some people, I think it made them more uncomfortable about being at school. Some stayed in their dorms the whole day that day,” said Low. Although rain had been present the evening before, Environment Canada weather data showed no reason to be alarmed on Sept. 5. The data, now accessible as past weather, shows good visibility and clear skies up until 8 a.m., when the thunderstorm first occurred. “It’s worth bearing in mind that on Friday morning Environment Canada had not issued any watches or warnings about severe weather or thunderstorms,” said Manning. Environment Canada’s website states that if you are caught outside during a severe thunderstorm, seek shelter in low-lying areas, avoid large bodies of water and steer clear of objects that might conduct electricity. Environment Canada also advises that once a safe place is located, stay in that location for at least 30 minutes after the last rumble of thunder. If you do happen to come across someone who has been struck by lightning, they will not carry an electrical charge, so it is okay to handle them. Promptly call first responders and administer cardio pulmonary resuscitation if the victim is not breathing. Important to mention is that both UW and Wilfrid Laurier University have a weather notification system, which is used to communicate with students, faculty and employees of a decision to close campus or cancel classes. For now, UW is continually cooperating with police and waiting to take further action until the legal investigation is fully complete. “We need to wait until we’ve received a full accident report before we draw any conclusions about what we should be doing and whether we take any specific actions to prevent this accident from happening again,” said Manning.